The European natual gas market looks set to remain well supplied through the second quarter of 2019, with only limited upside risk to the current bearish price trend. For power, a mixed hydro picture in southern Europe going into Q2 is balanced by solid nuclear availability, solar additions and improved interconnection. And while Brexit is set to offer near-term carbon price volatility, underlying fundamentals indicate weakening EU Allowance prices due to coal-to-gas switching. 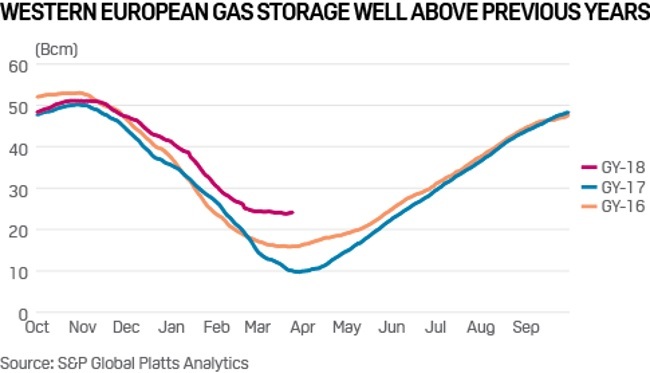 Gas storage stocks are at record highs following one of the mildest winters on record, with inventories in west Europe around 17 Bcm up on the year as of the end of March. 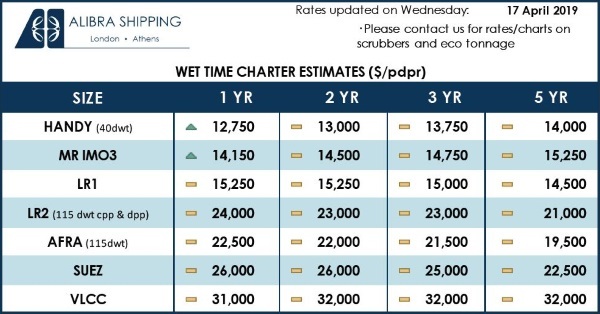 And on the back of a much-anticipated global LNG glut, LNG supplies are expected to remain healthy into Europe through the Summer 19 — especially given continued low JKM prices and weak Asian demand. 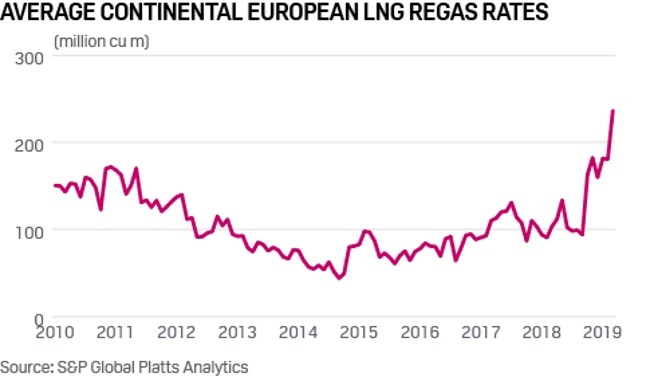 As global LNG supplies are seen stepping up through the year, Europe is set to continue to play the role of global gas market “balancer”, with its liquid trading hubs, spare LNG import capacity and fuel switching capabilities. 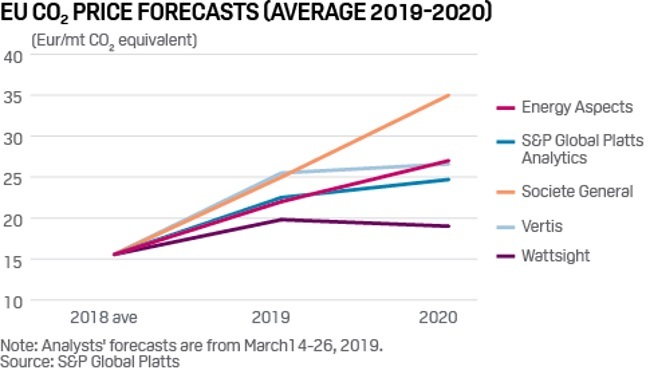 S&P Global Platts Analytics forecasts LNG send-out in northwest Europe doubling in Q2 on the year to 115 million cu m/d, though send-out could move higher if the JKM price does not recover. 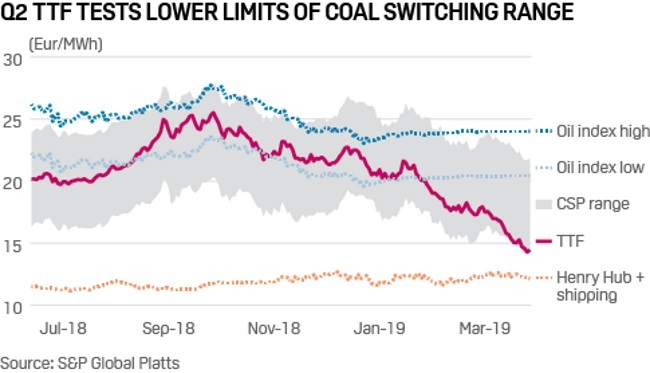 Coal-to-gas switching is expected to be strong in the European power sector, with Platts Analytics forecasting gas-for-power demand this summer doubling on the year to 82 million cu m/d, equivalent to 19 GW of baseload generation. “The outlook remains bearish,” according to James Huckstepp, senior analyst at S&P Global Platts Analytics. “Prices will be supported by the coal-to-gas switching that we’re already seeing in continental Europe, lower oil-indexed Algerian flows, and a pull-back in customer nominated Russian pipeline gas,” Huckstepp said. BBL reverse flows, due only by the end of Q2, will allow more exports from the long UK market to the Continent, amplifying the bearish pressure on European gas markets. This leaves the market questioning where the next level of support could come from, but there are a number of factors that could limit a further fall in European gas prices. Coal-to-gas switching levels remain dependent on volatile carbon pricing. Russian flows are likely to be down-nominated by customers to minimum take-or-pay levels given the availability of cheaper gas at the hubs, with the turn down seen at 35 million cu m/day on the year, according to Platts Analytics. However, Gazprom may choose to place the under-nominated volumes on its Electronic Sales Platform (ESP) to maintain European market share. 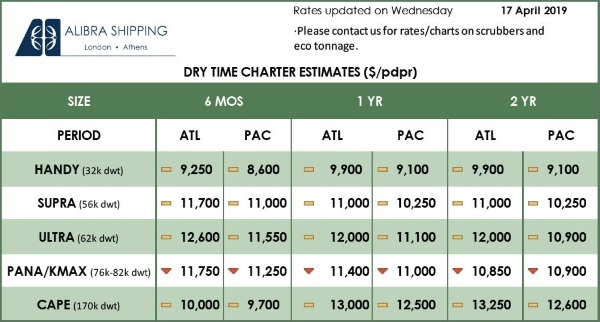 There is some risk that US LNG exports could be restricted by a further fall in netbacks, making the short-run marginal cost of exporting US cargoes uneconomic. There is at least $1/MMBtu of additional downside before US LNG netbacks turn negative, however, and even if they did turn negative there is no guarantee that production will shut in immediately, according to Platts Analytics. European power markets look to be well supplied going into Q2, with a north-south Europe hydro outlook divide the only bullish factor amid improved nuclear availability, a larger wind/solar fleet and growth in interconnection. Spanish hydro stocks are trending below 2018’s plentiful levels, seen at 48.2% capacity or 9% down on the year. Italian stocks were down 0.2% on the year at 35.7% in February, but concerns over low snowpack level and precipitation weigh on their outlook. Swiss stocks, however, are entering spring at a 12-year high, while those in France, Austria and Germany are reported to be close to long-term norms. Crucially, Nordic stocks at 40 TWh are back to normal, having entered the winter at a 7 TWh deficit, with strong north European wind generation in Q1 giving Norwegian reservoirs a chance to recover. Nuclear’s position has also improved over the winter, with the near-term outlook little changed on the year. Improved French availability has more than offset niggling outages in the UK, while Belgium’s fleet is back in action after a winter of unplanned outages. 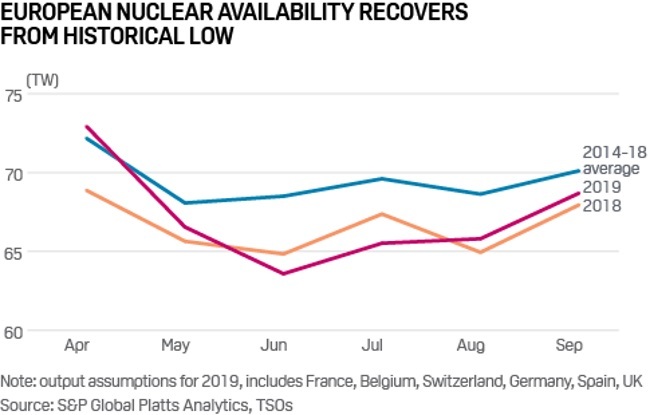 Platts Analytics has lifted its French nuclear output expectations by 1.3 GW to 39.3 GW this summer, removing a previous shortfall in Q2. “The French fleet exhibited renewed flexibility in March, with unusually steep turn-downs observed at weekends. With such flexibility the fleet can run harder in positive price periods and turn down more easily in low/negative ones,” Platts Analytics’ Giuliano Bordignon said. Average wind and solar output this summer, meanwhile, is bound to rise after 16 GW-plus was added over 2018, taking total combined capacity to 300 GW across Europe. Helping to integrate this green energy, meanwhile, are new links between GB-Belgium (1 GW) and Germany-Netherlands (1.5 GW). On the other hand, a 900 MW Swiss-Italy link damaged in October is unlikely to return before July, while traders are also facing the first summer for the split German-Austrian pricing zone. A moment of truth awaits the carbon market in Q2, with the potential impact of a UK withdrawal from the EU Emissions Trading System overshadowing other factors in the short term. Extension of the Brexit deadline to April 12 has prolonged uncertainty over whether UK emissions will be regulated by the EU ETS in 2019. EUA contracts for December 2019 delivery averaged Eur22.25/mt in Q1 2019, showing a volatile trading range of Eur18.40/mt to Eur25.73/mt. March saw prices consolidate in a tighter range of Eur20.50/mt to Eur23.54/mt. Analysts say a no-deal Brexit could devalue carbon prices by at least Eur5/mt, while agreement on a deal could prompt a price rally, potentially back up to the year-to-date highs of just under Eur26/mt. Annual forecasts, meanwhile, have been revised down since December. Cheap gas continues to exert downward pressure on carbon prices through coal-to-gas switching, reducing generation’s carbon intensity. This could cap upside for carbon prices in Q2, even if a Brexit deal is agreed keeping the UK in the ETS to end-2020. A poll of five analysts in March gave an average price forecast of Eur22.96/mt for 2019 overall, rising to Eur26.46/mt for 2020, lower than forecasts polled in December 2018 at Eur25.04/mt for 2019 and Eur26.82/mt for 2020. One of the few supply-side factors that could change in Q2 is any signal from the German government on its plans to cancel EUAs linked to coal and lignite-fired power plant closures, which would be in line with the recommendations given by the country’s coal commission in January. Any announcement could still be months or even years away. Dates to watch for in Q2 include April 1, when the European Commission will provide partial verified CO2 data for 2018, expected to show a drop of around 3.5%-4% from 2017 levels. April 30, meanwhile, is the deadline for companies to hand over EUAs to match 2018 emissions, which could spur increased buying activity in the spot market and daily auctions, ahead of that date.